Megavoltage electron beam therapy is an important treatment modality in radiotherapy, providing unique choice to treat superficial tumors., Electron beams have been produced initially by betatrons, and by microtrons followed by linear accelerators. An appropriate dosimeter must be used to determine the dose accurately at a point with minimum perturbation of electron fluence. The drawbacks of the dosimeters such as destructive technique, annealing process , and ineffectualness in reestimating the dose with thermoluminescent dosimeters, reduced lifetime with metal oxide semiconductor field effect transistors (MOSFETs), necessity for corrective actions required with diode,, cumbersome measurements with cables (MOSFET, diodes), and non-suitability in patient dosimetry with plane-parallel ionization chamber (gold standard in electron beam dosimetry) persist the necessity to explore new dosimetric method for dosimetric verification. The dosimeters that are based on the luminescence properties of solids are highly suitable for in vivo and in-phantom measurements as they are available in small sizes providing high spatial resolution and wider dose range coverage with high precision.,, Optically stimulated luminescence dosimeter (OSLD) has been introduced into radiation dosimetry, yet it is well known as a suitable dosimeter in space dosimetry and personal dosimetry over a decade.,,,,, Despite the ability to measure small and large doses with high accuracy and precision, the drawback is that it has to be enclosed in a light-proof case owing to the nature of optically stimulated luminescence (OSL) phenomenon in the phosphor material (Al2O3:C). However, this drawback is easily overcome by encapsulating the sensitive element in a water equivalent light-tight plastic casing. A form factor difference of 50% with standard dot dosimeters enables to place this dosimeter in more restricted spaces, for instance, eyelid. The reported results of electron beam energy dependency with dot OSLD,, optical fiber,, and nanoDot  was <1%. However, higher response of 1.9% was observed in the uncorrected data of electron beams with 6 MV photon beam. 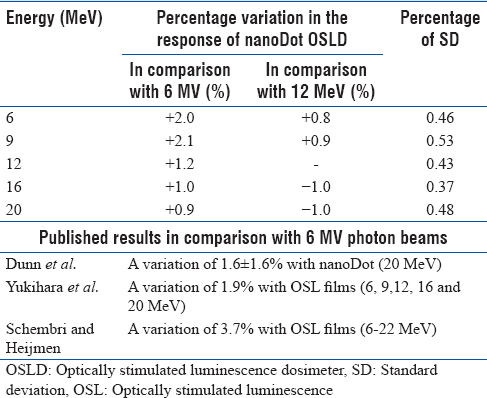 Schembri observed a discrepancy of 3.7% between electron (6–22 MeV) and 6 MV photon beams with OSL film. This significant difference points out the need for detailed investigations with careful attention to the experimental conditions. In addition, the other dosimetric responses with therapeutic electron beams such as field size, reproducibility, long-term fading effect, reader stability, and signal depletion per readout of nanoDot OSLD were studied, and the results were discussed. The OSLDs used were commercially available nanoDot dosimeters (Landauer, Inc., Glenwood, USA), and they are 5 mm diameter and 0.2 mm thick discs of Al2O3:C. These discs are encased in a 10 mm × 10 mm × 2 mm light-tight plastic case to prevent depletion of optical signals due to light. The bar code information in the nanoDot OSLD enables identification of each dosimeter and recording of the reading with ease. InLight microStar reader (Landauer Inc., Glenwood, USA) was used to read the optical signals of the OSLDs, with the reader warm up time of 10 min. The reader system includes an external PC, installed with a special software system to acquire the data, export to Microsoft Excel spreadsheet for analysis, and an optical annealing unit with recommended bleaching time of 6 h. During readout, OSLD is stimulated with a light of wavelength 540 nm, and the luminescence emitted is of wavelength 420 nm. The optically bleached OSLDs were read before irradiation, and the postirradiation readout was done after the transient signal decay. The resultant OSL counts reported were the difference between the pre- and post-irradiation optical signals of OSLD. The stability of the reader was checked before each readout session to ensure that the variations are within limits recommended by the manufacturer. With the intrinsic system check, reader stability was assessed by measuring the background counts (DRK) from photomultiplier tube (PMT), the counts from 14 C (CAL), a small exempt source to indicate the consistency of the PMT and counts from PMT to check the stability of the beam intensity of the light-emitting diode. The values within the tolerance limit indicate the acceptable stability of the reader. In every measurement, four OSLDs were used and average of 4 readings of OSL counts represents each data point of the measurement. Unless stated otherwise, the precision in the measurements was <2% (1 σ). The ionometric measurements were performed with a calibrated NACP-02 parallel plate ionization chamber developed by Nordic Association of Clinical Physicists. The chamber has a sensitive volume of 0.16 cm 3, incorporated with a front window of thickness 0.5 mm made of graphite covered with a mylar foil of 0.1 mm thickness as water proof. The dose 1 electrometer (Scanditronix Wellhofer AB, Sweden) of high precision is used along with the chamber and maintained at a polarizing voltage of 200 V. The ion chamber and electrometer were calibrated in absorbed dose to water according to TRS 398 reference dosimetry protocol in a Cobalt-60 beam. The data obtained with OSLDs was compared with ion chamber measurement wherever applicable. Measurements with electron beams were performed in a Clinac DHX linear accelerator (Varian Medical Systems, Palo Alto, CA, USA). During irradiation, the dosimeters were placed at the reference depths [Table 1] corresponding to their electron energies (6, 9, 12, 16, and 20 MeV) with various electron applicators at 100 cm source to surface distance (SSD). The irradiations were done with a nominal dose rate of 400 MU/min and a known dose of 200 cGy was delivered for all dosimetric measurements unless otherwise mentioned. Measurements were carried out in plastic water phantoms made of white polystyrene material of size 30 cm × 30 cm with various thicknesses having a density of 1.04 g/cm 3. The slabs of 10 cm thickness were used for backscatter in all irradiation set ups. A specially designed perspex slab with a groove arrangement was used to place OSLDs with minimized air gap during measurements. To ensure batch heterogeneity, element correction factor (ECF) for each OSLD (ratio of the average signal of the batch to the individual OSL signal) was calculated. For uniform irradiation,60 Co beam was chosen to simultaneously irradiate the OSLDs to a known dose of 2 Gy at 5 cm depth with a field size of 20 cm × 20 cm. The histogram [Figure 1] shows the distribution of ECF values from 0.90 and 1.07 better than the reported distribution  and a coefficient of variation <1.5%. This could be attributed to the improved production process of the supplier. Ninety percent of the dosimeters fall within 5% of the mean. The ECF obtained was applied to the raw readings of OSL in the successive uses in all measurements. 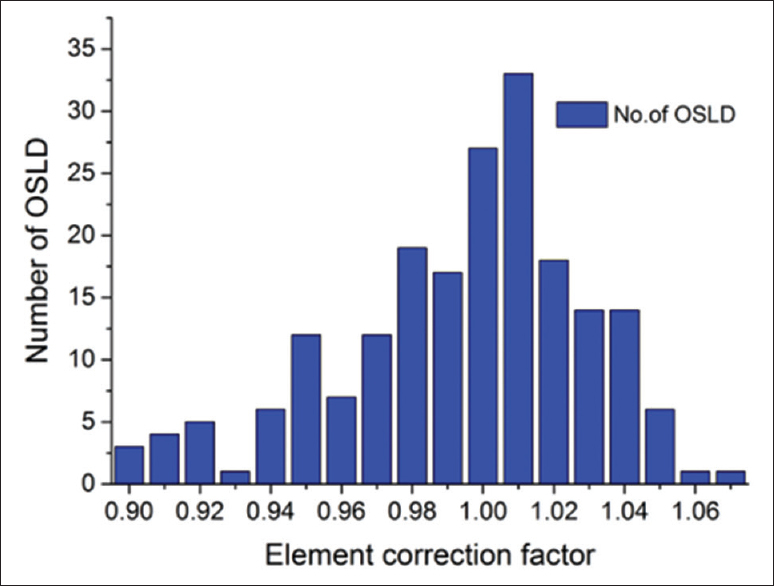 Figure 1: Histogram of the distribution of element correction factors of 200 optically stimulated luminescence dosimeters. To establish the field size dependency, nanoDots were irradiated with electron applicators of 6 cm × 6 cm, 10 cm × 10 cm, 15 cm × 15 cm, 20 cm × 20 cm and 25 cm × 25 cm. A dose of 200 cGy was delivered by positioning the dosimeters at the reference depth of each energy level with 100 cm SSD. The measurement uncertainty was calculated, and it was found to be <1.5%. This indicates the independency of nanoDot response with field size. The results obtained suggest that OSLD can be used instead of ion chamber in the relative output factor measurement as there is no change in trend in the effect of OSL response compared to ion chamber. However, it may be noted that for 6 MV photon beams, Schembri and Heijmen  reported a maximum discrepancy of 2.5% with the use of OSL, but there is no such study for electron beams. In addition, no dose rate dependence was observed for dose rates from 100 MU/min to 600 MU/min for a dose of 200 cGy delivered at the reference depths of electron energies with 15 cm × 15 cm electron cone applicator (SSD = 100 cm). Within the measurement uncertainty, this study confirms the dose rate independence of nanoDot OSLDs for the dose per pulse. Yukihara et al. have also shown the dose rate variation of 1% in the response of OSL package of polyester film up to 1000 MU/min, with 9 MeV electron beam. 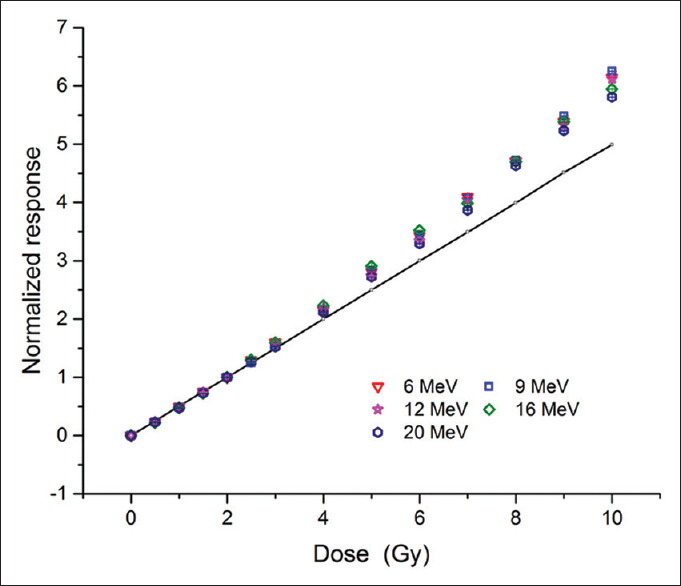 The variation in the energy response of OSL dosimeter was tested with five different electron energies of 6, 9, 12, 16, and 20 MeV and compared with 6 MV photon beams by delivering 200 cGy [Table 2]. A maximum variation of 2.1% was observed for 9 MeV electron when compared with 6 MV photon beam. To investigate the reproducibility of OSLDs with repeated irradiations, the dosimeters were exposed to identical doses three times in three different ways. First, OSLDs were irradiated to a dose of 8 Gy with an increment of 2 Gy and read after every exposure of 2 Gy with a minimum wait period of 10 min. The exposed OSLDs were optically bleached after each irradiation (bleach) and made ready for the next exposure. Second, the absorbed dose in the OSLDs was accumulated to a dose of 8 Gy in steps of 2 Gy without bleaching (accum) the dosimeters, and the OSLDs were readout. Third, OSLDs were irradiated to a dose of 8 Gy in a single session (SS), and the readout was done after the wait period. The OSLD irradiations were carried out with 6, 12, and 20 MeV electron beams at their corresponding reference depths in phantom with 15 cm × 15 cm applicator. [Figure 3]a,[Figure 3]b,[Figure 3]c show the response of dosimeters when they are bleached in between irradiations (bleach), accumulated the OSL signals without bleaching (accum), and irradiation of OSLD in a SS for 6, 12, and 20 MeV, respectively. The error bar represents the standard deviation of OSLD readings during readout. The accumulated response of OSLD was found to increase with dose and energy. The percentage difference observed between bleached and accumulated response was 3.9% in 6 MeV, 4.4% in 12 MeV, and 5.9% in 20 MeV electron beams at 8 Gy. The response variation of OSLDs due to accumulation of dose in an SS was found to be <2% with optically bleached OSLDs. A maximum difference of 7% with 6 MV photon beam was reported by Miller and Murphy. In our study, it has been noticed that the response of nanoDot OSLDs without accumulation of dose had shown no change in sensitivity. As the optical bleach extends the useful life of OSLD, it can be conveniently used multiple times eliminating the supralinear effect. A supralinear corrective action is required if the OSLDs are irradiated with high doses (HDs) more than 3 Gy or if the doses are accumulated without bleaching. However, the ability to optically reset and reuse the nanoDot OSLD is the extreme beneficial feature of this dosimeter in large scale dosimetry program where more than hundred OSLDs would be used. 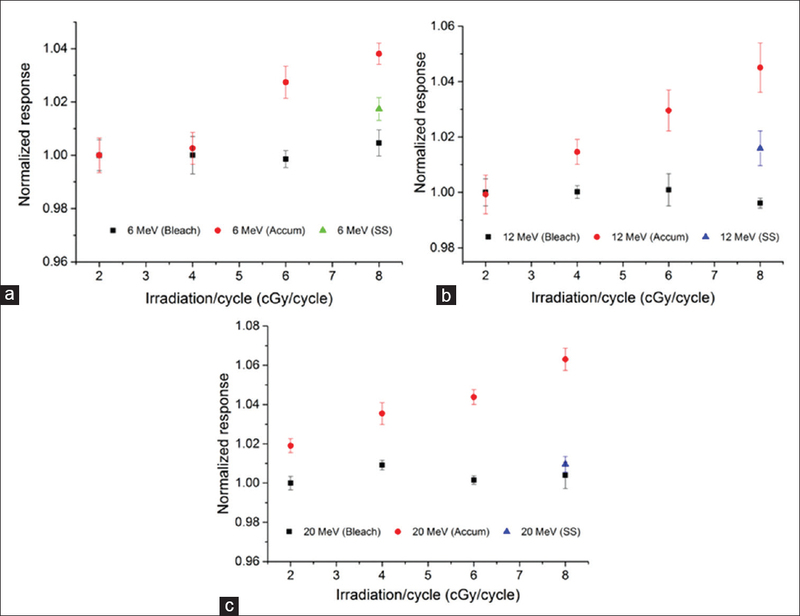 Figure 3: Reproducibility of optically stimulated luminescence dosimeters when irradiated to a total dose of 8 Gy with an increment of 2 Gy with bleach (bleach), without bleach (accum), and single session for (a) 6 MeV (b) 12 MeV (c) 20 MeV. The decay in OSL signal as a function of time was assessed by exposing nanoDot OSLDs to a low dose of 2 Gy and a HD of 10 Gy with 6, 9, 16, and 20 MeV electron beams at the reference depths with 100 cm SSD and an applicator size of 15 cm × 15 cm. The dosimeters were stored at room temperature and checked for the periods of (a) short-term (s/min/h), (b) mid-term (few days), and (c) long-term (months). OSLDs were read immediately after irradiation as early as 40 s, every day for the first 5 days, and then once a week for 5 weeks. The long-term fading was evaluated by taking OSLD reading monthly once for about 8 months. [Figure 4] shows the transient signal decay in OSL signal as a function of time with 6 and 20 MeV electron beams for 2 Gy. The rapid drop in the optical signal response due to the transient signal from the unstable electron traps depend on the energy of electrons. The drop in signal from 40 s to 20 min was found to be 10.7% for 6 MeV beam, whereas 15.9% for 20 MeV electron beams. It was evident from the graph that a minimum wait period of at least 10–15 min after the irradiation is required to achieve stable readout; accordingly, this was followed during all other measurements. The fading beyond 20 min post-irradiation was found to be similar (0.2%) for 6 and 20 MeV beams. The decay rate of fading stayed constant in every 1 month period (<1%), and the same effect was observed over a period of 8 months. 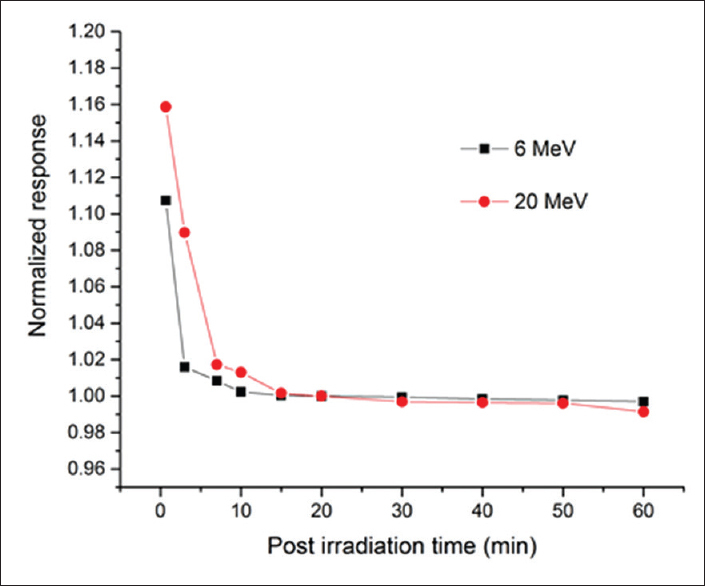 Figure 4: Post-irradiation fading of optically stimulated luminescence response from 40 s to 60 min following irradiation to 2 Gy of 6 MeV and 20 MeV electrons. The signal loss during successive readout of OSL dosimeter was analyzed by exposing OSLDs to 2 Gy and 10 Gy of 6, 12, and 20 MeV electron beams (100 cm SSD) with 15 cm × 15 cm applicator at the reference depths. The OSLDs were read two hundred times successively, and the signal depletion per readout is shown in [Figure 5]. The percentage reduction in signal with electron beams of 6 MeV and 20 MeV for a dose of 200 cGy was 8.6%, and 9.3%, respectively. With a dose of 1000 cGy, the variation was 12.3% for 6 MeV and 15.8% for 20 MeV electron beams. These results indicate that the depletion rate depends on dose and energy involved during irradiation. 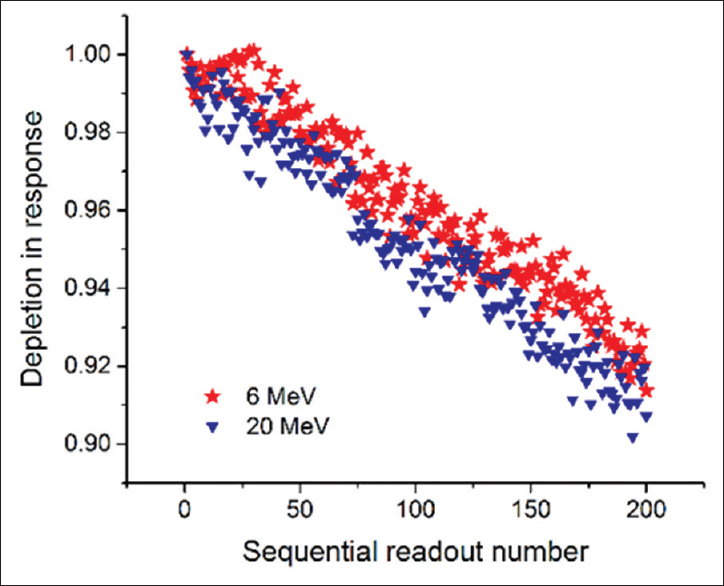 Figure 5: Depletion in response of optically stimulated luminescence dosimeters (irradiated to 2 Gy) during sequential readout (200 times) with 6 and 20 MeV electrons. The electron beam energy dependence of nanoDot OSLDs was studied for the linearity of dose response, dose rate, field size, reproducibility, reader stability, fading characteristics, and depletion of signal per readout. Although negligible fading for post-irradiation storage from 20 min to several months, acceptable precision and linearity in the desired range, and high reproducibility make nanoDot dosimeters very attractive for the dosimetry of therapeutic electron beams, a note should be made for changes in sensitivity at doses beyond 3 Gy and electron beams energy dependence in reuse, short-term fading, and signal depletion on repeated readout. This study was supported by a grant (AERB/CSRP/58/06/2014) from the Atomic Energy Regulatory Board, India. Hogstrom KR, Almond PR. Review of electron beam therapy physics. Phys Med Biol 2006;51:R455-89. Amin MN, Heaton R, Norrlinger B, Islam MK. Small field electron beam dosimetry using MOSFET detector. J Appl Clin Med Phys 2010;12:3267. Strydom WY, Parker WI, Olivares MA. Electron beams: Physical and clinical aspects. In: Podgorsak EB, editor. Radiation Oncology Physics: A Handbook for Teachers and Students. Vienna: International Atomic Energy Agency (IAEA); 2005. p. 273-99. Eveling JN, Morgan AM, Pitchford WG. Commissioning a p-type silicon diode for use in clinical electron beams. Med Phys 1999;26:100-7. Attix FH. Introduction to Radiological Physics and Radiation Dosimetry. Hoboken, NJ: John Wiley and Sons; 2008. Essers M, Mijnheer BJ.In vivo dosimetry during external photon beam radiotherapy. Int J Radiat Oncol Biol Phys 1999;43:245-59. Viamonte A, da Rosa LA, Buckley LA, Cherpak A, Cygler JE. Radiotherapy dosimetry using a commercial OSL system. Med Phys 2008;35:1261-6. Chung JB, Lee JW, Suh TS, Lee DH, Choe BY, Kim YS, et al. Dosimetric characteristics of standard and micro MOSFET dosimeters as in-vivo dosimeter for clinical electron beam. J Korean Phys Soc 2009;55:2566-70. VanDam J, Marinello G. Methods for in vivo dosimetry in external radiotherapy. ESTRO Booklet on Physics for clinical Radiotherapy No.1, Leuven- Apelddoorn, Belgium: Garant Publishers; 1994. Yorke E, Alecu R, Ding L, Fontenla D, Kalend A, Kaurin D, et al. Diode in vivo dosimetry for patients receiving external beam radiation therapy. Report of the American Association of Physicists in Medicine (AAPM) Task Group 62.AAPM Report No.87 (Madison, WI: Medical Physics Publishing 2005). Scalchi P, Francescon P. Calibration of a MOSFET detection system for 6-MV in vivo dosimetry. Int J Radiat Oncol Biol Phys 1998;40:987-93. Electron beams with mean energies at the phantom surface below 15 MeV. Supplement to the recommendations by the Nordic Association of Clinical Physics (NACP) 1980. Acta Radiol Oncol 1981;20:401-15. Kinhikar RA, Sharma PK, Tambe CM, Mahantshetty UM, Sarin R, Deshpande DD, et al. Clinical application of a OneDose MOSFET for skin dose measurements during internal mammary chain irradiation with high dose rate brachytherapy in carcinoma of the breast. Phys Med Biol 2006;51:N263-8. Pradhan AS. A concern on in-phantom photon energy response of luminescence dosimeters for clinical applications. J Med Phys 2010;35:187-8. Paliwal B, Tewatia D. Advances in radiation therapy dosimetry. J Med Phys 2009;34:108-16. Yukihara EG, Yoshimura EM, Lindstrom TD, Ahmad S, Taylor KK, Mardirossian G. High-precision dosimetry for radiotherapy using the optically stimulated luminescence technique and thin Al2O3:C dosimeters. Phys Med Biol 2005;50:5619-28. Aznar MC, Andersen CE, Bøtter-Jensen L, Bäck SA, Mattsson S, Kjaer-Kristoffersen F, et al. Real-time optical-fibre luminescence dosimetry for radiotherapy: Physical characteristics and applications in photon beams. Phys Med Biol 2004;49:1655-69. Andersen CE, Marckmann CJ, Aznar MC, Bøtter-Jensen L, Kjaer-Kristoffersen F, Medin J. An algorithm for real-time dosimetry in intensity-modulated radiation therapy using the radioluminescence signal from Al2O3:C. Radiat Prot Dosimetry 2006;120:7-13. Yukihara EG, McKeever SW. Optically Stimulated Luminescence: Fundamentals and Applications. West Sussex, UK: John Wiley and Sons; 2011. Mrčela I, Bokulić T, Izewska J, Budanec M, Fröbe A, Kusić Z. Optically stimulated luminescence in vivo dosimetry for radiotherapy: Physical characterization and clinical measurements in 60 Co beams. Phys Med Biol 2011;56:6065-82. Kerns JR, Kry SF, Sahoo N. Characteristics of optically stimulated luminescence dosimeters in the spread-out Bragg peak region of clinical proton beams. Med Phys 2012;39:1854-63. Jursinic PA. Characterization of optically stimulated luminescent dosimeters, OSLDs, for clinical dosimetric measurements. Med Phys 2007;34:4594-604. Reft CS. The energy dependence and dose response of a commercial optically stimulated luminescent detector for kilovoltage photon, megavoltage photon, and electron, proton, and carbon beams. Med Phys 2009;36:1690-9. Andersen CE, Aznar MC, Bøtter-Jensen L, Bäck SÅ, Mattsson S, Medin J. Development of optical fibre luminescence techniques for real time in vivo dosimetry in radiotherapy. Vol. 2. Vienna: IAEA; 2003. p. 353-60. Kim DW, Chung WK, Shin DO, Yoon M, Hwang UJ, Rah JE, et al. Dose response of commercially available optically stimulated luminescent detector, Al2O3:C for megavoltage photons and electrons. Radiat Prot Dosimetry 2012;149:101-8. Yukihara EG, Mardirossian G, Mirzasadeghi M, Guduru S, Ahmad S. Evaluation of Al2O3:C optically stimulated luminescence (OSL) dosimeters for passive dosimetry of high-energy photon and electron beams in radiotherapy. Med Phys 2008;35:260-9. Schembri V, Heijmen BJ. Optically stimulated luminescence (OSL) of carbon-doped aluminum oxide (Al2O3:C) for film dosimetry in radiotherapy. Med Phys 2007;34:2113-8. Dunn L, Lye J, Kenny J, Lehmann J, Williams I, Kron T. Commissioning of optically stimulated luminescence dosimeters for use in radiotherapy. Radiat Meas 2013;51:31-9. Yukihara EG, Whitley VH, Polf JC, Klein DM, McKeever SW, Akselrod AE, et al. The effects of deep trap population on the thermoluminescence of Al2O3: C. Radiat Meas 2003;37:627-38. Yukihara EG, Whitley VH, McKeever SW, Akselrod AE, Akselrod MS. Effect of high-dose irradiation on the optically stimulated luminescence of Al2O3:C. Radiat Meas 2004;38:317-30. Edmund JM, Andersen CE, Marckmann CJ, Aznar MC, Akselrod MS, Bøtter-Jensen L. CW-OSL measurement protocols using optical fibre Al2O3:C dosemeters. Radiat Prot Dosimetry 2006;119:368-74. Miller SD, Murphy MK. Technical performance of the Luxel Al2O3:C optically stimulated luminescence dosemeter element at radiation oncology and nuclear accident dose levels. Radiat Prot Dosimetry 2007;123:435-42.